Because I always need to have a regular coffee shop, I went back to CoffeeWorks Project in the morning. Again, I ordered an Americano and the lemon curd muffin that made me feel a little bit sick the previous day and found a spot where I could sit and use the internet. Though I’d been planning on this trip to London for months, I hadn’t actually planned out what I was going to do. I had written down about fifty things on a single sheet of a legal pad while I was at work, folded it up, and stuffed it in my backpack before I left. I took it out while I was waiting for my coffee and looked it over. The first two items on my list were the Victoria & Albert Museum and the National Portrait Gallery. Katie had mentioned an exhibit that was “on” at the V&A about wedding dresses that was supposed to be good and I like portraits in general, so I decided those two museums would do for my first day and figured out a route using an app called Tube Map. On the Tube, I people-watched. An older man wearing a green velvet suit with a pink shirt and bow tie who I tried and failed to photograph. Two couples on holiday together, husbands guffawing at their own crude jokes, wives clinging to their husbands faux leather jackets in an attempt to avoid the germs on the pole that I was holding with my bare hands. Several different women with the same schoolmarmish look, their hair pulled back tightly in low buns, wearing high-necked blouses under blazers too thin for the weather. I walked through a long tunnel from the Tube stop to the V&A. 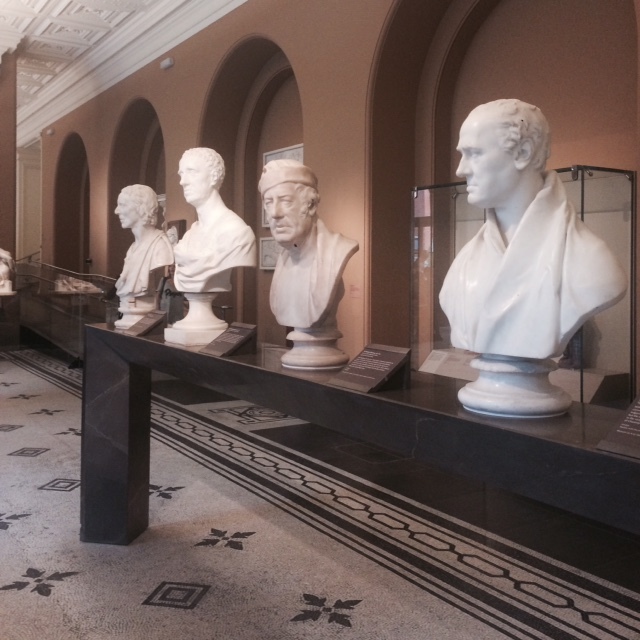 And then I walked into the museum, smiled at a security woman and entered a long hall full of sculptures. There was no ticket line, no one asking to look inside my purse, only a plexiglass box with a suggested donation printed on the side. 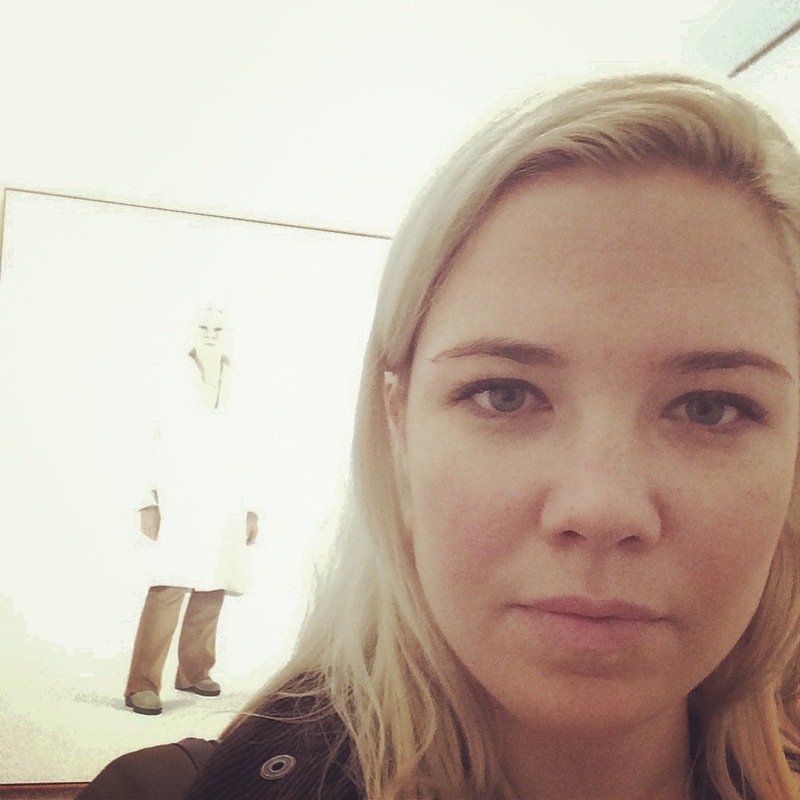 I walked slowly through the sculpture hall, wondering where I might find a map or a sign to point me in any direction. I eventually found a kiosk outside of the Constable exhibition, where the attendant allowed me to buy a ticket to the Wedding Dresses exhibition and gave me a map, which I think I shoved in my bag and never looked at again. I walked back through the sculpture hall and found the entrance to the Wedding Dresses exhibition. It was surrounded by some sort of permanent UK-fashion-through-the-ages collection, which I inspected alongside other women, on day trips with their girlfriends or daughters or yawning husbands. Both in this exhibit and inside the cylindrical structure that held the Wedding Dresses, I heard at least fifteen comments about which clothing items people might have worn in Jane Austen’s time. 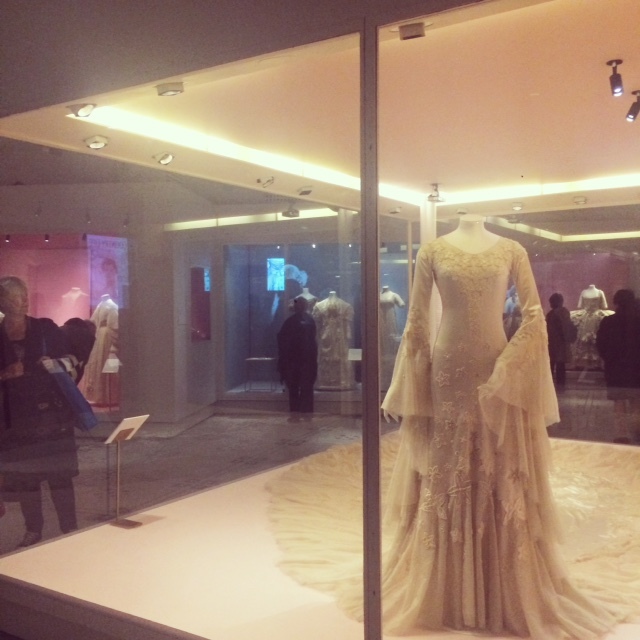 The Wedding Dresses exhibition turned out to be more about the evolution of our treatment of clothing than weddings, which was a relief. Women went from wearing their best Sunday dresses to the local church in the eighteenth century to commissioning wearable art for their ceremonies in the twentieth and twenty-first. I liked the idea that women used to alter the dresses that they wore on their wedding days in order to wear them again in less formal situations. Of course, there wasn’t a single dress from David’s Bridal or its UK equivalent on display among the contemporary dresses, but I do think that the idea that a wedding dress should be special and one-of-a-kind – even if it’s actually not – has been prevalent for so long that showing a dress a middle class woman would wear today as part of this exhibit alongside couture would be pointless. 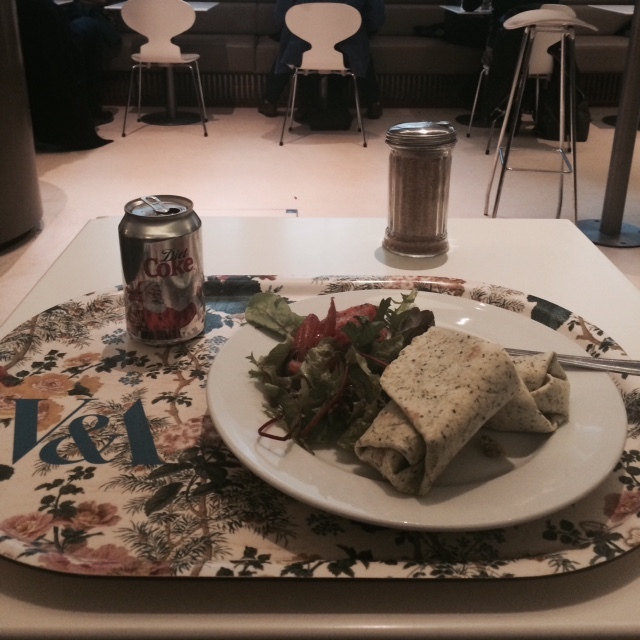 It was past lunchtime and I didn’t feel like finding a place to eat, so I went to the V&A cafe. I bought a sandwich and salad and carried them to an empty table on an adorable tray. I attempted, with varying degrees of success, to eat and read Renata Adler’s Speedboat at the same time. I’ve always found some comfort in at least looking busy while eating alone. It makes the actually being alone part a bit more tolerable. Two sixties-ish women, who I deemed to be academics even though I can’t remember them actually saying anything about academia, sat at the table next to me with pastries and a pot of tea between them. One of them spoke with an American accent. Her occasional British inflections told me that she’d been living in or around London for sometime, but she also could have been there for a week for all I actually knew. I’m no Sherlock Holmes and I’ve met plenty of assholes who’ve come back from a summer abroad with an unintelligible accent. The women gossiped about a mutual acquaintance who’d gone crazy and left her husband who’d cheated on her for years for a much younger man. I tried to write down the details of the story in my phone but I worried they suspected that’s what I was doing, so I stopped. Distracted, I looked at the same page of Speedboat for so long that I got annoyed with myself and put it away. A V&A employee sat on the other side of me with her baby, who pawed at my sweater until I smiled at him. I packed up my things, reluctantly left my tray and plate on the table for someone else to clean up, and left the museum through the sculpture hall, where an older gentleman sketched a larger statue of what was probably a Greek god while surrounded by a crowd of schoolchildren. Once I figured out that the oldest portraits were on the third floor, I took the escalator upstairs and wound my way down through the rest of the museum. Many of the portraits were of people who aren’t of much importance to us now, but they were important or rich enough during their lifetimes to have portraits painted of them. For two hours, I briefly considered hundreds of individual lives. I was drawn mostly to the women, who were actresses and wives and mistresses and scientists and queens and writers and daughters of wealthy men. I was reminded of a book I had when I was a girl that had short biographies of each First Lady of the United States, with one page devoted to their life story and one to their portrait. I read it over and over again and am still able to recall most of their full names, small details from their childhoods, and what they wore in their portraits. I hurried back to Chris and Katie’s, where I met Chris so that we could take the bus together to meet Katie at her office. On the way there, I heard about Chris’s trip to Japan, from which he’d just returned. I thought about how much more traveling I have left to do in my lifetime. Chris and Katie and I ate at a restaurant in Shepherd’s Bush called The Bird in Hand. The menu was full of modern takes on classic British fare, which is, I think, true of many menus in London. We had a scotch egg and foie gras and something called ale soup and the first of many pizzas that I would unexpectedly eat during my trip. 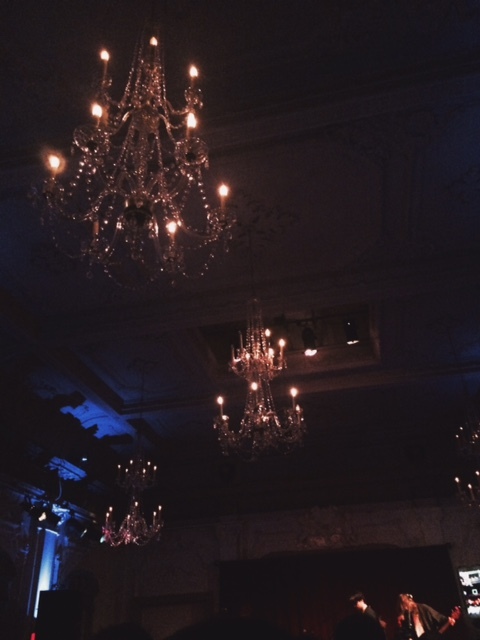 We saw our friend Will’s band, Delta Spirit, play at Bush Hall. The chandeliers and the ornate moldings in the main hall made me imagine one of those choreographed dances you see in a BBC costume drama having taken place there centuries ago. However, upon consulting Wikipedia, I discovered that Bush Hall had been built in 1903. During the show, I drank two Jack & Cokes. I don’t really like whiskey, which I forget all the time. I watched people dancing in the crowd. Two women on the older end of middle-aged shook their butts together. Two men in natty business casual wear nodded their heads and pumped their fists. A young man with a leg injury waved his right crutch in the air near the stage. After the show, as the audience was filing out of the hall, I took a photo of Chris with a girl who had recognized him from his band. She introduced herself to both of us and as I shook her hand and told her my name I thought about saying something like, “I’m not important,” but then I thought it better to say nothing like that at all.